I decided to try Susan Lenart Kasmer's Ice Resin product (jeweler's grade). She has developed a plunger system that dispenses the two ingredients needed at the same time so you get the correct measurement. Stir it thoroughly, pour into bezels and wait for it to set up, then cure. That's a very simplified description and I made a couple of errors as you may be able to see from the two images on the left. You get the glass effect over your image. Be sure to read more about it on her blog. 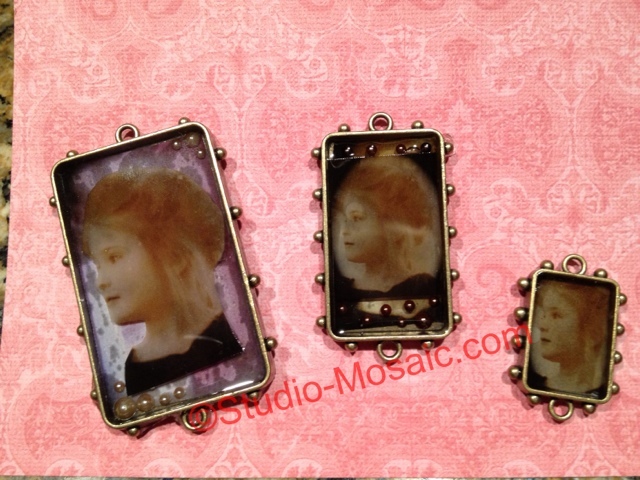 Various shades of pearls were added to the two of the bezels. I used her Paper Saver product on the photo and didn't wait for it to dry thoroughly so the first pour didn't work well at all. (Ok, so one of these days I will get patient about art things.....usually I'm a patient person!) So, I repeated the process, adding the same image to the hardened surface and poured another batch of Ice Resin on top without using the Paper Saver and it worked fine. The image is of my granddaughter Emmalee, who is 4 this week. I dressed her in one of my t-shirts after I braided her hair out of the way so that we could do some painting together. She turned and caught a glimpse of herself in a mirror. I was lucky enough to snap this photo. Needless to say, it's become my go-to photo lately. I've ordered some more product and round bezels - we'll see how I do with them. OH, by the way, I had leftover product and used a couple of other products to fill with the Ice Resin. 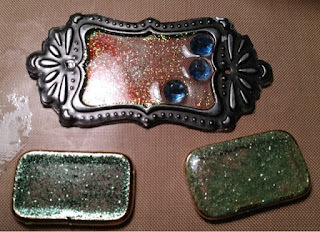 I overfilled some of these - one is a metal label holder from Close to My Heart® - the other two are metal belt loops. Glass beads and glitter were added to the resin immediately after pouring. I just trimmed the overfilled-excess Ice Resin from the edges with scissors. Try it! Lots of possibilities and the easy dispenser takes away the nervousness about precise measuring. I know I'll be figuring out lots of way to use this product!